Solitary, Poor, Nasty, Brutish and Short is a work in progress made in collaboration with Joanna Malinowska. The project will result in a full-length, quasi-ethnographic film attempting to portray the phenomenon of countless Polish people choosing to spend their leisure time reenacting the romanticized lifestyle of the 19th century Great Plains indigenous nations. In some cases this fascination can even become a primary profession or source of income. In 2015, Jasper and Malinowska began the project by conducting interviews, completing preliminary research, and shooting some test photography in various parts of Poland. Currently they are planning to move on to the production phase of the project, which they believe strongly relates to the contemporary discourse on the subject of cultural appropriation. The goal is to realize this project within a period of eight to ten months. 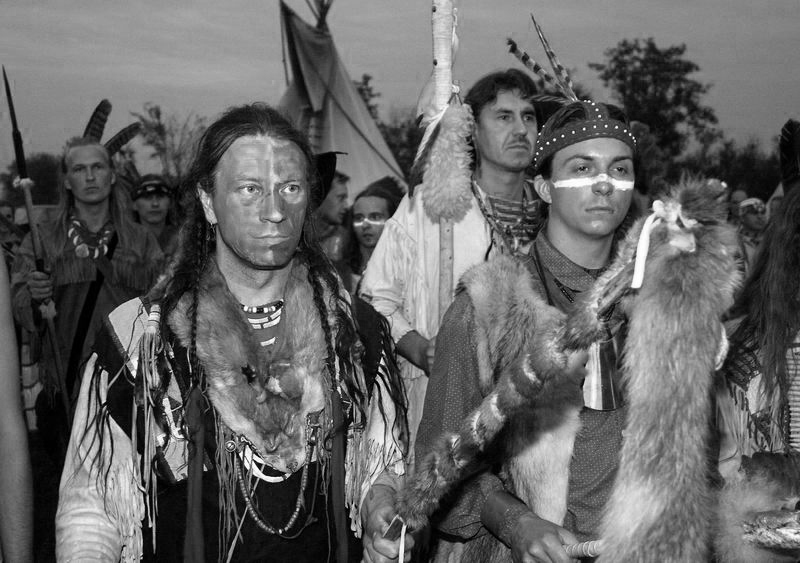 The Native American impersonators in Poland are loosely organized under the umbrella of the Polish Association of Friends of Native Americans, which has been active in Poland since the 1970s. Its large membership (in the tens of thousands) comes from many different regions of the country and from very diverse backgrounds. There are fractions of this larger group involved in academic studies and others involved in political activism that support causes of the contemporary indigenous Americans. Perhaps the largest fraction of this group practices a form of cultural escapism by living in a fantasy world of their own construction, and there are others who represent an entrepreneurial persuasion by running tipi villages and faux artifact museums. The common denominator among all of these subgroups however is their astounding devotion and dedication to both their knowledge of Native American cultures and their replication of the material cultures of indigenous peoples. There are Poles who have never spent a day of their lives on the American continent and who have never met an actual indigenous American, but nevertheless they possess a vast knowledge of aboriginal cultures, their history, and they are capable of replicating the most intricate examples of indigenous material culture – to a quality that could compare to objects in the collections of the Smithsonian and other similar institutions in the United States. In addition to the craft-based dedication in replicating the material cultures of indigenous Americans, there are many ongoing scholarly projects dedicated to ethno-linguistics: the translating and compiling of indigenous mythology, oral and song traditions. These “Slavic Native Americans” often quote historical analogies as the cornerstone of their affiliation with indigenous American peoples, believing that there is shared experience between the colonization of the Americas and the numerous invasions suffered by the Poles throughout history. Another less heroic reason behind the existence of this perplexing movement might be the adventure novels of Karl May, featuring a fictional noble savage and Apache chief - Winnetou. These novels were widely popular in Poland and inspired a fascination for many Polish children in indigenous cultures.